Ray Kappe relaxes in the central living space, which offers views onto other shared family zones. Behind him is a view down into his office. Half a level up, Shelly Kappe stands at the entrance to the upper family room. Rail-free stairs are unnerving for a first-time visitor, but they amplify the home's free-flowing sense of space and structure. The stairs were built inside one of the six concrete towers, and they lead from the central living space to the front door. The experience of moving from the enclosed stairway into the expansive open family area is dramatic. The front door is tucked under a cantilevered terrace. Ray sits at the central hearth on the north end of the comfortable sunken living area. From this perspective, you can see how the interior spaces flow into one another, passing one half-level up into the breakfast nook and kitchen and out from there onto the overgrown hillside. The various built-in furnishings have all been there since the house's construction. In addition to wood and concrete, the other main material in the house is quarter-inch single-pane glass: No room is without a natural light source, whether from skylights, mitered corner windows, or clerestories, as in the old bedroom of the Kappes' son Finn. The paintings are by their other son, Ron. The exposed wood and raw concrete throughout the house are offset by bold colors, chosen by Shelly and the children. The house's warm hues can clearly be seen in this window seat in Ray's office. The grandchildrens' room, on the same, well-lit side of the house as Ray's office, is adorned with dolls and books. The terrace at the front of the house. Wooden beams extend beyond the structure to create shading trellises for the terraces at the front and the back. This detail shows the conjunction of concrete with wooden beams, where flush glass windows angle outward to the canopies of nearby trees. The detail also encapsulates Ray's vision for the house: a synthesis of the rational and the intuitive. Ray Kappe, now 80, sits in the master bedroom. He says he's as busy now as he was 40 years ago. Shelly walks along the perimeter of the house, near the central living area. The design of the house, with its many rooms, nooks, and open family spaces, "was so ahead of its time," Shelly says, "that, to young people coming here, it still feels contemporary." 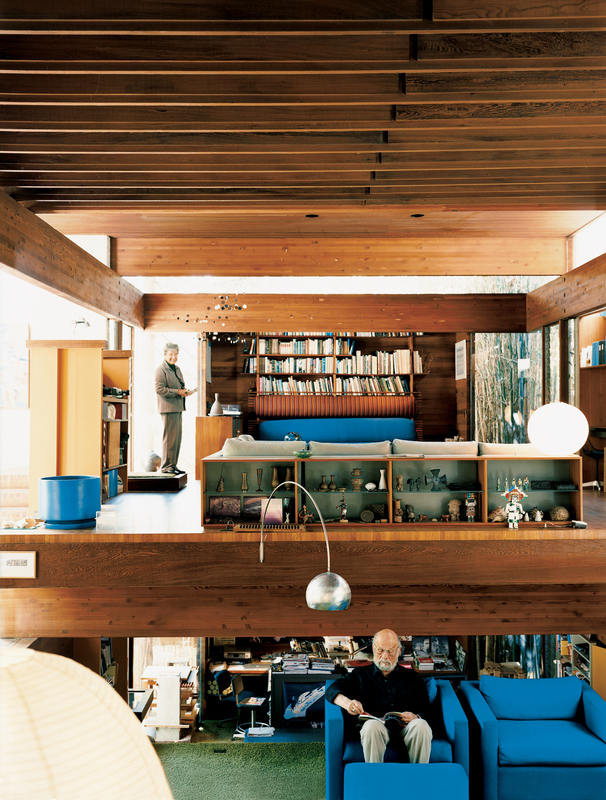 Before I moved to Los Angeles from London in 1991, I had not heard of architect Ray Kappe. At the time, design buffs overseas were interested in quirky, anti-establishment West Coast architecture by people like Frank Gehry and Eric Owen Moss. But after arriving in L.A., I found myself looking for a route into the real architectural life of the city. Following up on countless recommendations, I met Ray and Shelly, his wife and partner. I also had an opportunity to visit their house, designed by Ray in 1965 and located in a canyon in Pacific Palisades. “Giddy” is how LivingHomes founder Steve Glenn recently described feeling upon first entering a Ray Kappe–designed house. Giddy is how I felt, too, standing on the flying walkways of Ray’s own residential wonder: A controlled explosion of space, the house spills out over multiple levels, intersected by vertical planes of glass, wood, and concrete. Natural light pours in through floor-to-ceiling windows. In all directions there are views of the lush hillsides. The space and materials—and the light and the setting—all somehow act in perfect union. I soon learned that everyone who has seen this house has been similarly transported. I also learned that Ray Kappe was a titan, albeit a soft-spoken one, of the Los Angeles design world. He founded the renegade school SCI-Arc in 1972, actively participated in dialogues about architecture and urban planning, and served as a mentor—or simply an influence—to many. But by the early ’90s, Kappe was taking it easier—still advising SCI-Arc and doing one or two projects a year, but nonetheless cooling his engines. Fast-forward to Ray’s 80th year, in 2007, and he had become man of the hour. There has been a surge of interest in his work, and he is busier than he’s been in a very long time. Ray was born in Minneapolis in 1927 to Romanian immigrants. In 1940, the family moved to Los Angeles, where Ray got his first taste of California modernism, at his own junior high school: Emerson Middle School, designed by Richard Neutra. He went on to study architecture at the University of California at Berkeley. After his final year of school, in 1951, he worked as a draftsman on Eichler Homes for the admired Northern California firm Anshen + Allen. He then moved back to L.A., where he worked for two years with Carl Maston, one of the region’s lesser-known but highly skilled modern architects. In 1954, they each designed a six-unit apartment building side by side on National Boulevard in West Los Angeles, before Ray opened his own practice. The new firm was never idle, designing around 50 apartment buildings, commercial projects, and private houses in its first decade alone. These were mostly post-and-beam constructions organized around a single module. Ray chose to experiment with modules because he was looking for a system of construction that could be prefabricated. Modules also permitted the open plans and spatial fluidity that characterize his buildings. “What I wanted to do as an architect,” he says, “was to continue what had been laid out by the early modern architects.” He thought people should “come out of cooped-up houses and enjoy nature and space, and live in houses that were more of their time.” In response, Ray designed split levels, terraces forming roofs, and flying walkways with multiple vantage points. “Manipulation of space is very important in his architecture,” says Shelly. SCI-Arc, the Southern California Institute of Architecture, fast became internationally recognized for its open, experimental attitude and teaching methods, with alumni such as Shigeru Ban (one of the early students and a protégé of Ray). But as postmodernism flourished internationally, SCI-Arc moved away from Ray’s interest in the union of the rational and intuitive toward the idiosyncratic and irrational. He left his post as director in 1987. Twenty years later, tastes have come full circle. A younger generation is again interested in prefabrication and modernist architecture, especially in its potential for sustainable design. In 2003, Steve Glenn asked Ray to produce a line of prefabricated, sustainable houses, to be called LivingHomes. Ray has since designed about 15 houses for the company. The second, the Wired LivingHome, was completed last year in Brentwood, Los Angeles. While many of Ray’s earlier buildings warrant as much attention as the LivingHomes have received, he didn’t seek the press, nor did he ever shape his work to current trends. Instead, he has maintained a commitment to a set of architectural principles—principles that found expression in a prolific career, the school he founded, and houses that can make you feel giddy.